This is the link to the interview Wendy did with Ron Hogan while in NYC.She and Jack traveled there the first week of November to do a bookstore event at WORD UP in upper Manhattan. It was a really great night! Wendy will be at MOUNTAIN HERITAGE LITERARY FESTIVAL at Lincoln Memorial University in Tennessee, on Saturday June 16th. Wendy and Jack will present workshops at WHIPPOORWILL FESTIVAL in Berea, Kentucky (at Homegrown Hideaways, not on Berea Campus!) July 12-14. What a thoughtful, insightful review about LITTLE BOOKSTORE and its place in Appalachia, by Jeff Minick at Smoky Mountain News. This quotation, buried in the middle of Wendy Welch’s The Little Bookstore of Big Stone Gap: A Memoir of Friendship, Community, and the Uncommon Pleasure of a Good Book (ISBN 978-1-250-01063-6, $24.99), could serve as the banner for this wonderful account of a used bookstore and the community in which it came to life. 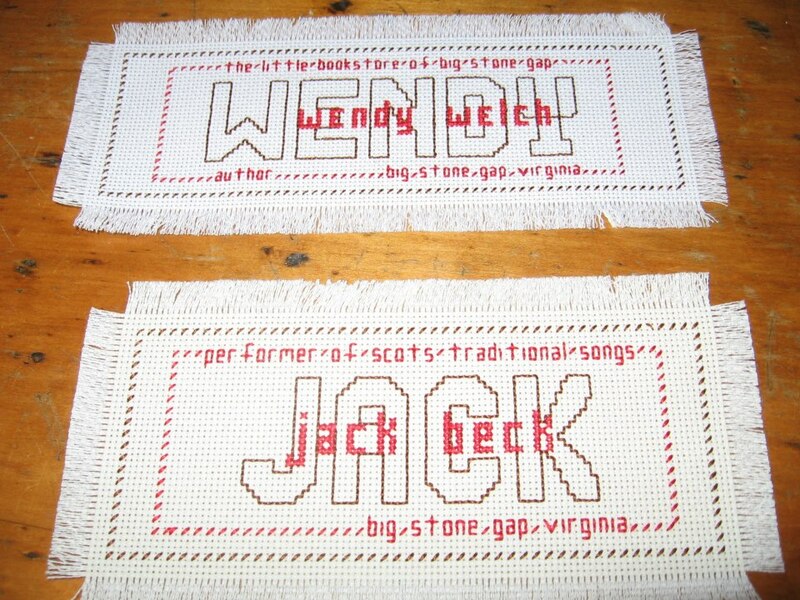 Wendy Welch and her husband Jack Beck, a native of Scotland, had lived overseas, and had then returned to the United States, where they both worked high-powered jobs. In addition to her professional life, Wendy Welch also worked as a storyteller. After becoming dissatisfied with the back-stabbing and cutthroat office politics at her place of employment, Welch and her husband decided to seek out a quieter life. 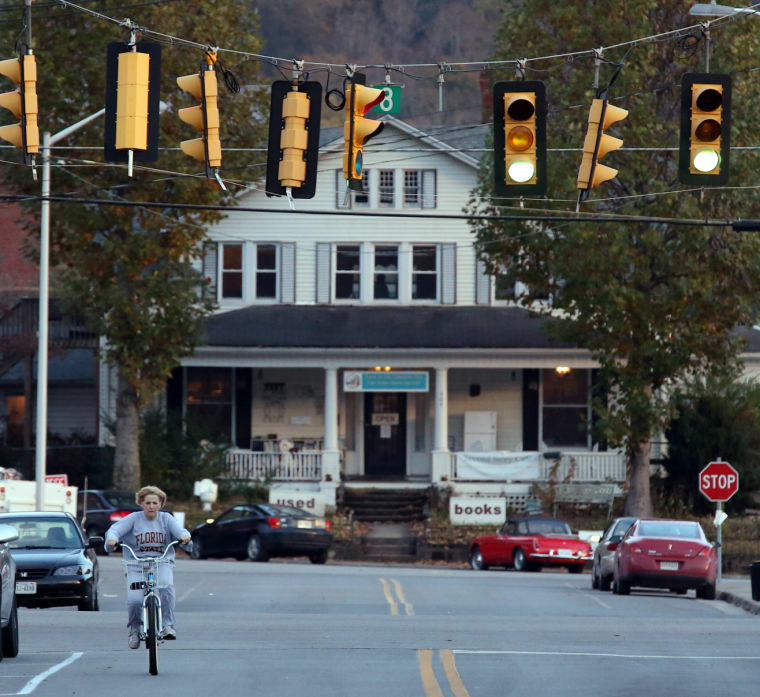 Their search brought them to Big Stone Gap in rural Virginia, a former coal town which was suffering, like so many small towns, economic upheavals. Here they found a five bedroom Edwardian house which, despite its exposed wiring, rickety fans, and need of paint, struck them as their dream home. It also sparked another of their dreams. For years the two of them had fantasized about owning a used bookstore one day. Though the thought was at first a mutual jest, eventually it began to take on shape. On finding the house, they decided that the bottom floor would become the bookshop of their dreams. Welch takes readers on a humorous journey as she and Jack build the bookshop. They began with no books other than those from their own collection, and so purchase their books from yardsales. Welch’s sister cleverly advises them to advertise that they will pay for books from customers with promises of future credit, and the idea begins to bring in more and more residents of Big Stone Gap. In addition to describing encounters in the shop, Welch also gives us a fine portrait of this Appalachian town. In the chapter titled “God Bless You for Trying, Losers,” Welch shows her readers — and I suspect many of them may recognize the sensation — the difficulties of entering into the life of a tight community. When she is fired from a day job, which she’d taken to help support the store, a certain clique in the town begins gossiping about her, and some refuse to bring their business to the bookshop. She writes that “amid the innuendoes and nuances, relationships between insiders and outsiders — and who gets called which — can be as subtle as a homemade quilt.” She and Jack finally prevail in their quest for acceptance through their resolve to stay in the town and keep the shop open, and through Stephen Igo’s celebratory column about the shop that appeared in The Kingsport Times-News, bringing a sense of appreciation to Welch and more customers to the store. In further efforts to attract customers, and because both of them are community-minded, Jack and Wendy hosted many events at the store. Some of these were impromptu parties with wine and homegrown music, others involved occasions like Needlework Night, when women from the town gather to talk while crocheting and knitting. At the heart of The Little Bookstore of Big Stone Gap, of course, are books. Welch not only offers anecdote after anecdote about customers and why they buy certain books, but she also shares her own preferences in reading along with those of her husband. She discusses the place of the book in today’s digitalized culture, and the special place of second-hand bookshops in the book world. Her chapter “On Recommending Books” should send readers off to open old classics and newer novels. (I was particularly gladdened to see that she had recommended “Till We Have Faces,” which is for me not only the best novel ever written by C.S. Lewis, but a truly important work about relationships and the human spirit). Tales of the Lonesome Pine is the real name of Jack and Wendy’s bookshop, chosen because of the town’s association with John Fox Jr.’s novel The Trail of the Lonesome Pine. Both the bookshop and the town of Big Stone Gap are now on my “places to visit” wish list. For the present, however, The Little Bookstore of Big Stone Gap must serve as a sort of secondhand visit to this secondhand shop. And a fine visit it was. HOW COOL IS THIS?! Little Bookstore is a library staff pick in New Zealand. Thanks! “This book about books will capture your heart, whether you are a bibliophile and believe in the power that books have to bring people together, or are an admirer of those who live with purpose. Rita Knight, from Olympia, Washington, sent these gorgeous bookmarks to Jack and Wendy. Thank you, Ms. Knight! Right now we’re just riding that wave, being in the moment, enjoying the visitors and also opportunities the book’s brought to participate in events like the VA Festival of the Book, the Whipporwill Festival in KY, library and bookstore talks, giving a writing workshop here or there—fun things that start to fill up the calendar around daily obligations. Between and behind the busy-ness I’m writing fiction, and when things calm down I’ll get back to working harder on it. (She said, smiling.) Honest. Isn’t this a sweet book review? It’s from a church that is reading LITTLE BOOKSTORE for their book club. Library News from Bill Wade: A Used Bookstore in Big Stone Gap? That's Nuts! a story began to unfold. appropriate for our church library and I wanted you to know about it. trust ... it should be friendly and fun for customers and us." their bookstore a local church. book, and if you are like me, you will be planning a trip to Big Stone Gap. And below is the link to the TV interview Wendy did with “Virginia This Morning”- a fun time! The Roanoke Times was very complimentary of both book and bookstore, in the link below. And look what august company we keep in the Christian Science Monitor’s composite review of great books about books! Your book was amazing; I literally couldn’t put it down. I found myself in tears at the end of it because you somehow managed to restore my faith in humanity and my own future simultaneously. Also, permit me to mention that you are an incredible writer– I felt like I was actually living your journey. I can’t even begin to tell you how much this book helped me realize that it is totally plausible to expect and work for real happiness in life. If ever faced with the choice between something “important” and something better, I will think of you. I hope you know what my decision will be. 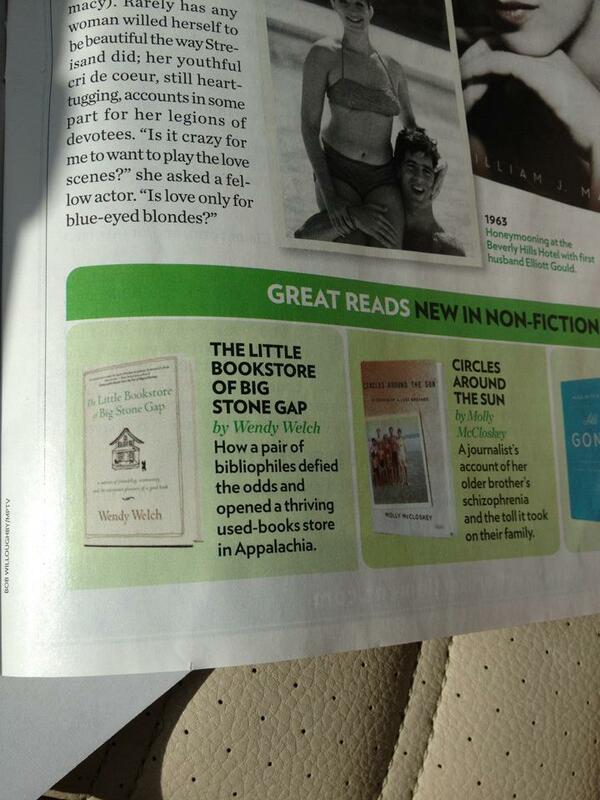 People Magazine listed Little Bookstore as a Great Read in Non-fiction! The Richmond Times Dispatch summed up the review below with: A skillful story of following your dream even when reality intrudes, a vivid portrait of small-town customs and quirks, a cornucopia for bibliophiles and a work of sincerity and humanity, “The Little Bookstore of Big Stone Gap” will captivate a few hours of your time and enrich your life, too. What a great article on Big Stone itself, and the book in particular, from Hampton Roads! 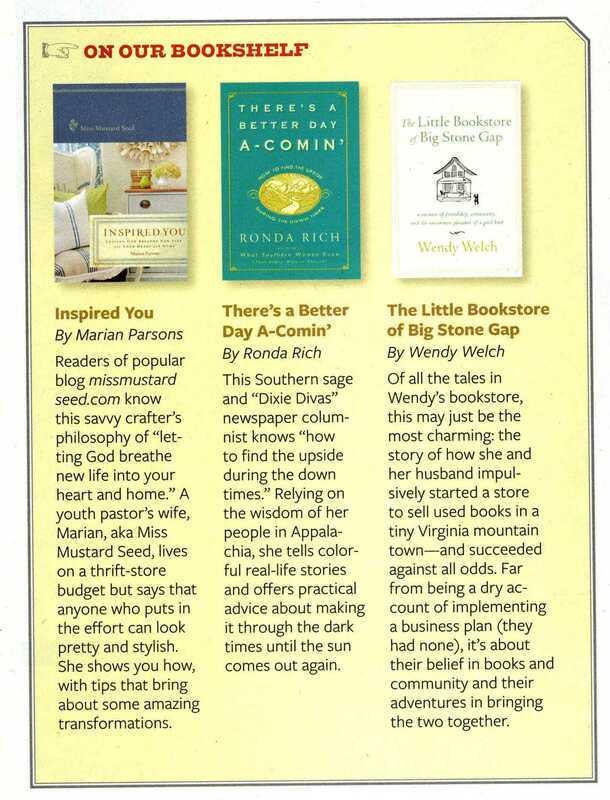 Redbook referred to The Little Bookstore of Big Stone Gap as “lovely” and featured it on their October “Inspiration Board” (page 23). You can see this online at their slide show. books to bring people together. Whoohoo! Publisher’s Weekly called The Little Bookstore of Big Stone Gap “beguiling” and said it “exudes enormous charm.” How nice is that?! Sorry the jpg below is a bit fuzzy, but you can use the link above if you prefer. Une offre d’emploi cocasse ! Devenir libraire-sitter, comme on peut s’improviser baby-sitter ? C’est la proposition de Wendy Welch et Jack Beck, qui possèdent l’établissement Tales of the Lonesome Pine, situé dans la ville de Big Stone Gap, en Virginie. Population : 5400 âmes. Le contrat est simple : tenir leur boutique durant deux mois, contre un logement et quelques avantages. Et un chat à nourrir. Ainsi qu’un chien. L’idée, c’est que Wendy vient de publier un livre, et qu’elle s’apprête à partir en tournée, à partir de l’automne. Et comme tous deux souhaitent profiter ensemble de ces voyages, sans pour autant fermer les portes de leur librairie, ils ont décidé de lancer une annonce. Then Litteratur Magazinet in Sweden published this; we think our shop looks cute in umlauts, too! Sökes: Bokhandelsvakt. Sälj böcker, mata katterna. Husrum ingår. Drömmer du om att driva en egen liten bokhandel? Nu finns ett gyllne tillfälle att pröva om det är så mysigt som det låter. Ägarna av en liten bokhandel i Virginia i USA söker nämligen en bokhandelsvakt under oktober och november. Men du måste gilla katter – för att att mata och gosa med ägarnas katter ingår också! 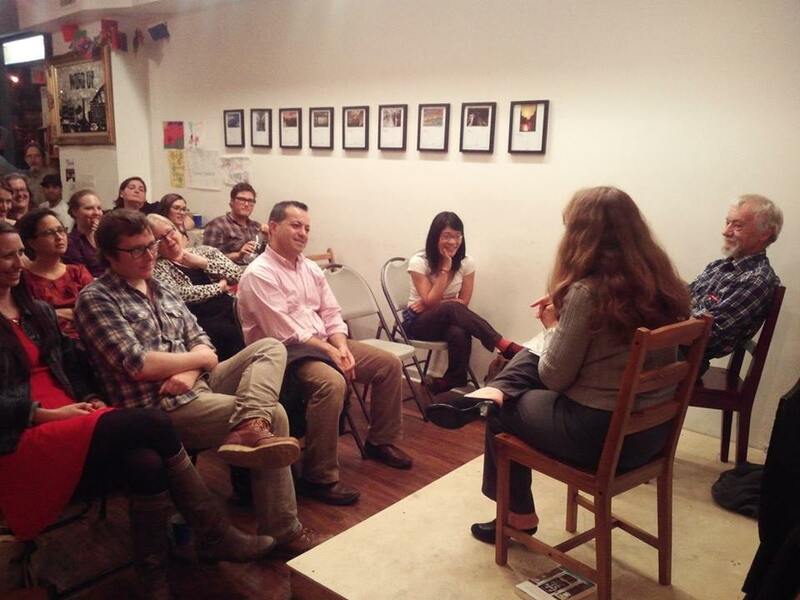 Ever wanted to run an independent bookstore? Maybe one in picturesque rural Virginia, in October and November? 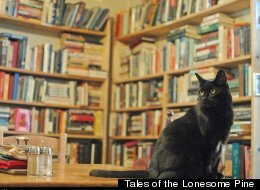 Now’s your chance.The owners of Tales of the Lonesome Pine used bookstore in Big Stone Gap (pop. 5,400) have put out a call for a bookstore-sitter. They will provide lodging and provisions in exchange for the bookstore-sitter keeping the store’s doors open for two months. and the Huffington Post ran this lovely piece, complete with our shop video! WASHINGTON — How would you like to wait out election season taking care of a used bookstore — and its attendant dogs and cats — in a small town in southernwestern Virginia? You’ve got until Friday to apply. And you’ve got competition. You may have heard about this opportunity already on NPR, in the Los Angeles Times, on the book website Shelf-Awareness. Potential shop-sitters please send to jbeck69087@aol.com your experience with litter boxes, history with books, proof you are nice but not a pushover, and what you would do if you were suddenly called home for a job or emergency, plus any questions you have for us. Thanks! and then a second one in response to an angry bookshop owner in California who called us "hobbyists." practically overnight! It also prompted Big Stone Gap local Elizabeth Cooperstein, MD, to write a scathing response. So let me get this straight. The measure of value is how much revenue is generated? If that is so, the only entities of value in far southwest Virginia are the coal companies; not the restaurant owners, not the dry cleaner, not the guy who fixes your car, not the farmer next door. Even the local hospitals and physician practices rely on medicare and medicaid, anathema in other parts of the country. I reckon if you live in an area with 150,000 people no one has to get a second job for benefits. However, we live here and we deal with the challenges and just because there is no money here doesn’t mean we don’t appreciate a bookstore and those willing to live here and run it. Please don’t send Books a Million missionaries. We are happy with our ‘hobbyists’. Here’s a review from Kirkus about the book that prompted the shopsitter hunt! Other reviews have appeared in Publishers Weekly, The Cozy Little Library Blog, and Library Journal. There have also been many reviews on Goodreads, with a 4.3 rating overall at last check. How a couple of outsiders captured the heart of a small Virginia community in the Appalachian Mountains and succeeded in the unlikely enterprise of opening an independent bookstore. When her husband, Jack, retired from his position as head of a college department in Edinburgh, the couple decided to move to the United States. Welch, an American ethnographer, had been offered a seemingly attractive position directing an arts nonprofit in the United States, but it didn’t work out. Checking out new places, they settled on Big Stone Gap, the scene of Adriana Trigiani’s popular novels as well as the 1908 classic, The Trail of the Lonesome Pine, by John Fox Jr. On impulse, Welch and her husband purchased an old Edwardian mansion in poor repair and then decided to open a secondhand bookstore, which they gave the whimsical name Tales of the Lonesome Pine Used Books, Music and Internet Café. In Scotland, the couple had spent weekends performing at local fairs (she as a professional storyteller and he singing Scottish ballads), and Lonesome Pine soon doubled as a community center with a writing group, Celtic songs and dancing, mystery nights, gourmet treats and more. They worked to draw people in from surrounding communities, and initially, their unlikely gamble proved to be a big success as the store thrived. However, to supplement their income, the author took a job at a local nonprofit and ran into a conflict on policy. Gossip spread that they were “uppity incomers,” her husband was refused membership in the Kiwanis club and customers fell away. 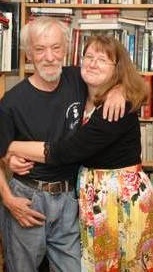 This time, they determined to stay and in time were accepted as “Jack and Wendy, who run our town’s bookstore.” Welch discusses the financial practicalities and the ephemeral aspects involved in creating a peaceful space where people can hang out. An entertaining book with a full cast of eccentric characters. First off I would like to say great blog! I had a quick question in which I’d like to ask if you do not mind. I was interested to find out how you center yourself and clear your head prior to writing. I have had difficulty clearing my thoughts in getting my ideas out. I do take pleasure in writing however it just seems like the first 10 to 15 minutes are usually wasted simply just trying to figure out how to begin. Any recommendations or hints? Thank you! I am a librarian in Indianapolis, IN. I just finished your book and was both charmed and moved. We will be discussing it at our Adult Book Discussion group this fall, and enlivening our discussion by including the owner of Bookmama’s, the private used bookstore around the corner. A question: how was it that the wrong name of Rosina Lippi’s book got into your book? I decided it sounded interesting to me (even if I am a man ) but it took a few extra minutes to find, since it is called *Homestead*, not *Homeland. * If you have already answered that question a dozen times, please just point me to the answer. I want to read Homestead before our book discussion, and I know our readers will ask the question about the title. Except my edition (St, Martin’s Griffin Oct 2013) has HOMESTEAD at the start of the section, and HOMELAND in the body of it. A few other typos, but much better than most books I read these days! I have read your book three times now and every time after finishing the last page, I smile. I hope you will write another as I love your authentic style. Me emocionó el artículo, dan ganas de ponerse a escribir un blog.